DEVO, Suicide, The Feelies, Joan Jett AND the Suburbs - all on the same bill? Yep, it happened - back in 1979 at the U of M FieldHouse. (Though apparently Jett didn't show.) 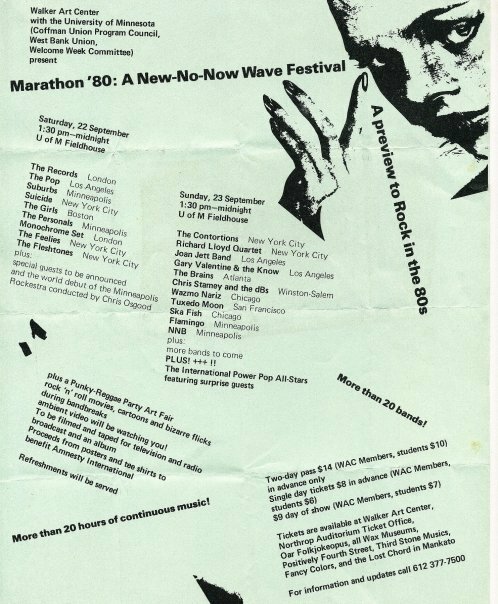 "Marathon '80: A New-No-Now Wave Festival" certainly wasn't joking when it boasted itself as "a preview to rock in the '80s." Apparently, this show was also known as the "M-80 Festival." Click on the image (uploaded to Facebook today by local musician Adam Levy) to take a closer look and read the extensive thread featuring tidbits by locals who were there. We sooo wish we were there. Some peeps on the thread also dug up some handy links to YouTube footage from the show. Hi, M-80 was held in 1979, contrary to how it looks. I've interviewed several of the musicians for my upcoming feb radio documentary which includes this fest. 1979, looking into the '80s! It would be awesome to see you add Curtiss A video "land of the Free" the big finale with several of the musicians from this -commandos, Suburbs. Flamingo (flamin' oh's) Dove - joining him on stage! It's a tiny video, though.